We wanted to thank everyone for their support of our efforts to raise money for United Cerebral Palsy of Greater Cleveland. We again participated in the Cleveland Triathlon — but this year was a little different. 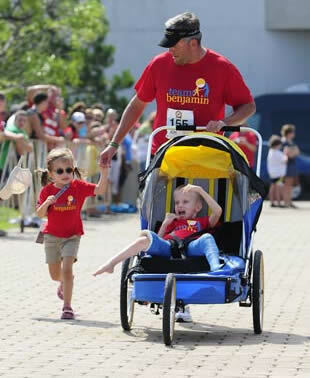 Due to hip surgery, Ben was unable to walk across the finish line like he did for the first time last year. However, he did a great job in the jogger on a hot muggy morning and in a half body cast. I was worried how he would do, but before I grabbed the handle bar of the jogger I looked at him and he flashed me his big smile and nodded as if to say “don’t worry, I got this” — and he did. The route was filled with fellow racers cheering us on, which was great to experience. And at the finish line Emily joined us to run the final few yards. All of this made it another great day for our family. This has been a challenging summer for us. After six weeks, Ben’s cast came off on August 10th. He is now beginning the difficult therapy that will eventually get him back on his feet. Ben is a relentless little boy and we’re convinced that he will soon walk again. And thanks to the great people at UCP, several children walked, surrounded by loved ones, across the finish line for the first time at the race. It was great to see. Thank you all for your help, encouragement and well wishes. If you want to follow Ben’s progress, we’re posting regular updates on a public Facebook page and Twitter.